mmm...yes...advertising ploys for animals. it's not just for kids anymore. What's awful about it is that when we're not buying dogs gourmet treats, we're teaching them not to beg and keeping them away from people food. To me it's like giving a kid candy flavored medicine. Dog food shouldn't look like people food and medicine oughtn't be yummy. emmerube, I'm still waiting for them to add a "scent" to televisions, so that way when a dog smells that yummy advertised treat in the store, they can start begging right away! 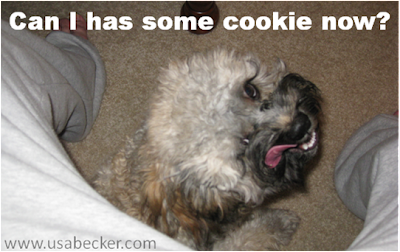 "Why someone decided your pooch needed 'delectable' gourmet treats is beyond me." I think it's because someone just figured out a way to make money off the fact that people who work all day feel guilty about leaving their dogs. And no! I'm totally not cynical at all. Why do you ask? Have you noticed they adopt the "selling crack" method of advertisement, too? They give out a few free samples in a bin by the register. Get your puppy hooked. Watch him drool for more next time you bring him in. All of a sudden liver treats just aren't good enough. Gotta be gourmet. Those suckers are probably raking in a fortune. >> Abby said: "You could put crap on a cracker and a dog would eat it if you presented it in a high pitched Valley Girl voice (so would most children, but I digress.)" What is it with high-pitched voices that dogs just love? Our friend's trainer swears by it. I refuse. For what it's worth, cdog thinks "crap on a cracker" sounds like an excellent treat. Throw in a worm and it'd be like "puppy smores"! What do teddy bears eat? How do I love that top image? Let me count the ways! Actually, imma skip the counting. Let's just call it "a lot" of ways. I used to work next to a dog bakery. I'm no less perplexed by them now than I was then, the better part of a decade ago. Like your second reason, I'd buy these no more than I'd buy a dog toy shaped like a human shoe. Why again do I want my dog gnawing on shoes? Hmm . . .
None more true! I recently dog-sat for two Bernese Mt Dog puppies, and during the course of one day they managed to try to eat: 1) deer poop; 2) horse poop; 3) aluminum foil; 4) Styrofoam; 5) napkins; 6) a hair brush. Clearly, dogs aren't discriminating unless people make it their mission to coddle them... What dog is born thinking they should be carried around in a $500 Louis Vuitton purse while snacking on an organic flaxseed cookie? I can fit my cat's head in my mouth, but I think a dog's head might be more than I can handle. No cookies for me, clearly. @Mybloginyoureye- For a minute there I thought somebody had kidnapped my dog. Then I saw "Bernese Mt Dog" and breathed a sigh of disgust... er, no, I mean relief. Definitely relief. And how many purses did that 500 bucks buy? Surely not just one. I never get free samples of crack when I buy pet food!!!!!!!! Ah, you've not shopped for pet food 'till you've done it with your pet at the local "Super Generic World of Pet Stuff" department store. They have everything from delux pooper scoopers to little mice that cdog is sure would make an even more excellent "gourmet treat".